The New and Exclusive Lynx Office Screen System has been developed as a low cost simple and functional office screen partition solution to divide open plan office spaces. Lynx creates infinite design opportunities in the modern workplace. The simple and clean line design has resulted in producing one of the most cost effective workstation systems on the Australian market. 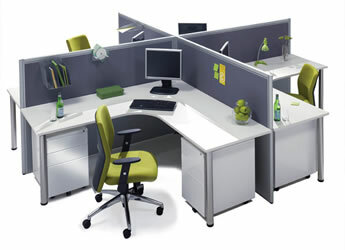 As a panel based system, Lynx provides privacy to the workstation user. The solid panel design affords maximum visual protection – ideal for busy passageways or for linear cubicle applications. Costs have been minimised with the clever utilisation of standard finishes and dimensions within the range. Lynx is the prime choice in the highly competitive workstation market – ideal for installation within tight lead times and cost restrictions. Lynx has been accepted by major corporate buyers as the optimum solution in a cost conscious market. Designed to accommodate both power and data cable management either above or below the worktop, Lynx is the ultimate workstation solution – function + value + availability. Lynx can also be customised to suit specific requirements – designer label fabrics and finishes. Designed to complement Lynx is a full storage product range – meeting tables, mobile pedestals, credenzas, bookshelves, desking and reception counters. The Lynx workstation system has been designed to accommodate power (Soft Wire) and data cable management. We use and recommend CMS Electracom Soft Wire for power services. "Soft or Modular Wiring enables the easy re-use of wiring when re-configuring workstation power distribution, without the waste associated with hard wiring. This not only saves time and increases productivity during on-site installation, but gives the designer maximum flexibility for future expansion." "Data / Telephone Outlets have been designed to accommodate RJ45 jacks. They will easily accommodate Cat 6 or Cat 5 data cabling."